Octahedron – A 300 foot high, floating weapons platform. Can be dropped from a warship in high orbit. Once it enters the atmosphere, it however about a mile above the ground. It’s equipped with an array of weapons and carries several squads of soldiers and fighters. A light class battle frigate, at about 250 feet in length. This a relic from a long discontinued corporate line, is commonly used by the Kildathie republic as a patrol ship. While it may be covered in scratches and patch jobs, it still has enough gun turrets and torpedo launchers to mean business. Marauders carry a fearsome array of weapons including a dozen heavy plasma batteries, torpedos, and a squadron of Asp fighters. A Marauder is protected by powerful shields, and despite being classified a Battleship, it is a large as the most Corporate Destroyers and Warships. Marauders are fully capable of carrying out campaigns on their own, but in larger confrontations usually act as support ships for the even large and more dangerous Dominators. When Derric Lorne and crew of the Pathfinder travel to the planet Sardonna in search of Droc technology, they discovery a Marauder that was damaged in the battle with the Coiypax corporation. The Battleship had crashed to the surface of Sardonna but remained largely intact. Ridg’cal cruisers are used by the Droc for transporting non-military personel and cargo. They carry light defensive armament for solo operations outside of Droc territory. But these vessels are usually found in large convoys, accompanied by support ships like Marauders. The Pathfinder is owned and operated by Captain Dren Bessourn, for his freelance salvage operation in the Outer Territories. The rest of his crew consists of pilot and first mate Ellie Nurrier, Fren the medic, Karris on security, Sauln and new comer Derric Lorne on acting as engineers. The Pathfinder its self is approximately 150 feet long, though most of its size is dedicated to cargo room and engine power. Leaving sparse room for living space, and a external bridge resembling a shuttle cockpit. Other features include four industrial strength tractor beams on the belly of the ship, and a pair of magnetic clamps on robotic arms. Eight vertical lift thrusters spread along the sides of the ships, and two massive Towing engines connected to rotating arms, allowing targeted power. These features combine to give the pathfinder the power to tow much larger vessels in space and or from a planet’s gravity. 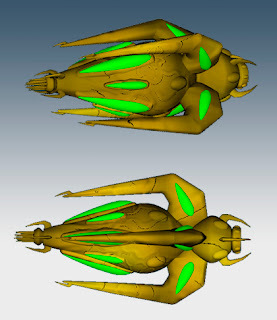 The ship was designed by Dol’barri shipyards, an insect-like race working under the Coiypax corporation. This background brought an unusual beetle-like influence to Pathfinder’s design. Asp fighters, small one one-man craft used by the Reptilia Droc. They’re fast and maueverable, with strong shields and an array of weapons including dual plasma canons and a payload of eight torpedoes. Defensive weapons include CCB’s, Counter Concussion Bombs. These small explosive devices can be ejected from behind when being pursued by an enemy fighter. Magnetic cuplinks help the bomb to lock onto it’s target and explode with enough force to destroy or disable the pursuer. These ships fly with wings vertically oriented, but when coming in for a landing turn sideways, the cockpit rotating proportionately with the ship. It’s most unique feature is its use a force field rather then steel or glass to enclose the ship’s cockpit. Asps are hyperspace capable, allowing them to travel great distances without of a carrier or other support ships. Their stealthy design compliment of torpedos make them very effect in solo attack missions. However Asps are more commonly used as support for larger Marauders and Dominators. The Dominator is five mile long warship making up the spear front of the Reptilia Droc fleet. It’s equiped with over a hundred heavy plasma turrets spread over the length of the ship, including it’s eight spires. This allows the Dominator fire on multiple targets in any direction simultaneously. It’s protected by powerful shields and thick armor plating made from a super strong alloy of metals unique to Droc Territoy. All these traits make the Dominator a formidable warship, but it’s greatest advantage is the Solaris canon. A wave of charged particles that fires from the blue crystal tip of the vessel. The Solaris particle are able to pass through a ship’s shields, and upon hitting the solid matter of a hull, causes it’s atoms to fission and explode. Instantly destroying its target. It takes five minutes for a Dominator’s reactor to recharge the Solaris canon’s battery after discharge. However a even a small battalion of Dominator firing together in a tactical line can devastate an enemy fleet in moments. The Solaris Canon can be focused into a small burst to cause maximum damage to a single target at long distance, or fire in a short-range wave to savage multiple targets. While Droc warrior caste rule the ground with their strength and skill, they rule the skies with the Dominator. Stinger are small fighter class ships employeed by the Korb. A single Stringer by itself is little threat, it possess no shields, hyperdrive, or plasma torpedoes. Howerever Stringers are carried into battle by the thousands and deployed by large carrier craft. Swarming their targets, they overpower them by shear numbers.